When I travel, I immediately go hunting for anything and everything medieval. I didn’t have to look far on my first day in Portugal’s capital. Above Lisbon’s skyline of colourful tiled houses and red roofs lies Castelo de São Jorge, a dominating, but beautiful, 11th century fortress in the heart of this vibrant city. If you’re planning out your “medieval places-to-see” check list for a visit here, this has to be near the top. 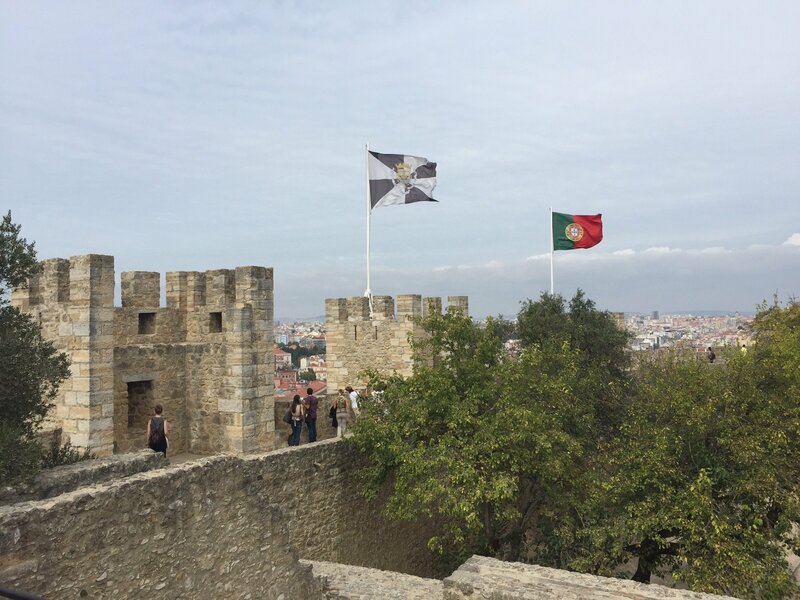 Walking along the castle walls, you can see the red and green flag of Portugal whipping in the wind alongside the black and white flag of the city. Photo by Medievalists.net. Since moving to London 2 years ago, I’ve been tremendously blessed to travel more than I ever have in my entire life. A flight to any European capital can be arranged for a fraction of the price a trans-atlantic ticket would normally cost me flying from Toronto. I’ve definitely taken advantage of this in spades, especially in 2015. Lisbon is my final stop this year as I take a hiatus from scurrying around Europe. Lisbon’s warmth, charm and the friendly Portuguese locals made this adventure a wonderful way to end a bustling, travel filled year. Walk along the castle walls from tower to tower. Photo by Medievalists.net. Background: Medieval and more…Castelo de São Jorge While São Jorge is a Moorish castle, some of the fortifications date to the 2nd century. Archeologists found evidence that there were people here as far back as the 6th century BC; Celts, Phoenicians, Carthaginians and Greeks inhabited this area. There is an archaeological site on the castle grounds that you can visit, but sadly, this appeared to be closed while I was there. Lisbon was once a Roman municipality so the site of the castle was used by Romans, later by Visigoths, and finally, it was rebuilt by Muslim Berbers in the 10th century. During the peak of the Reconquista, São Jorge was freed from Moorish rule by Afonso I of Portugal (1109-1185). Afonso was the first King of Portugal after winning independence from Galicia in 1139. Prior to this, Portugal was a county and his father was the Count of Portugal until his death in 1112 when Afonso was only 3 years old. A panorama of the castle courtyard. Photo by Medievalists.net. On October 25, 1147, Afonso won a decisive battle, The Siege of Lisbon, one of the few Christian victories of the Second Crusade. Afonso received help from Crusaders travelling to the Holy Land who were stranded in Portugal due to poor weather. They helped Afonso expel the Moorish overlords from the city and lay siege to the castle. After the fall of Lisbon to the Crusaders, some of them stayed behind and began the famous Anglo-Portuguese Alliance. Although the Alliance wasn’t solidified formally until 1386, the beginnings of this centuries long friendship can be traced to the assistance Afonso received from some English Crusaders during this important battle. After Lisbon became Portugal’s capital in 1255, Castelo São Jorge became the official home of Portuguese monarchs, the Alcáçova. It’s undergone numerous renovations; in the 14th century, it underwent extensive work and additions, including the creation of an outer wall. The castle was dedicated to St. George by João I of Portugal (1357-1433) after he married the English princess, Philippa of Lancaster (1360-1415). Over the course of the 15th century, the castle went from being a primarily fortified military structure to a formal royal residence. Cool fact: Famous Portuguese explorer, Vasco de Gama (1460s-1524) was received at Castelo São Jorge by King Manuel I ’The Fortunate’ (1469-1521) after her returned from discovering the sea route to India in 1498! A stunning view of the picturesque city of Lisbon from one of the castle’s 11 surviving towers. Photo by Medievalists.net. Turmoil and Tumult: The Early Modern Castle In the 16th century, the castle began to fall apart, especially after an earthquake in 1531 substantially damaged it. There was a brief attempt to rebuild the castle as a royal residence again, in the mid-1500s, but it was turned into a military/prison establishment after the political crisis of the 1580s when King Sebastian (1554-1578) died in the Battle of Alcácer Quibir (The Battle of Three Kings). This prompted a period of unrest as various claimants vied for the throne. The chaos ultimately led to Spain ruling Portugal for the next 60 years. Work continued on the castle well into the 17th century with a Soldier’s Hospital being added. In the devastating earthquake of 1755, in which most of Lisbon was destroyed, the castle was again badly damaged. Luckily, it was salvaged and then used by a charitable organisation to educate poor children. It was also the site of the first geodetic observatory in Portugal, in one of the castle’s remaining towers, now known as the Observatory Tower. An outside view of the castle. Photo by Medievalists.net.